Oligodendrocytes make a good-sized myelin that surrounds axons and allows humans to walk and see. In contrast, when axons do not get enough myelin, axonal function is incapacitated, with resulting deficits in cognition, behavior, and in the ability to move. In order to make sufficient myelin, each oligodendrocyte extends as many as 50 branches to reach all the distant axons. The capacity of each oligodendrocyte to extend these branches relies on the microtubules, which are the oligodendrocyte’s bridges to reach the distant shores, the axons. Microtubule strength is regulated by many factors, including the Tau protein, which is a microtubule-associated protein. The binding of Tau to the microtubules makes the microtubules healthy, which assists oligodendrocytes in reaching the axons with a good-sized myelin. The microtubule-associated Tau protein in oligodendrocytes enables cells to have good-sized cellular processes and sufficient myelin. As a consequence, walking is normal. However, if Tau loses its ability to bind to the microtubules, the myelin thickness decreases, so walking abnormalities occur. Panel A shows that oligodendrocytes have a healthy distribution of Tau in the cell body, along the microtubules and a healthy amount of myelin around the axons. 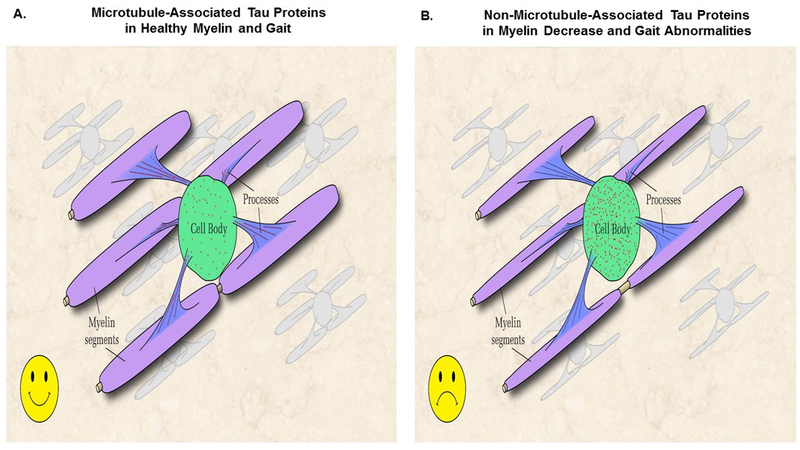 In contrast, Panel B shows that when Tau cannot bind to the microtubules, Tau distribution in the cell is altered, which decreases myelin around the axons and results in walking defects. The cell body of oligodendrocytes is shown in green, processes in blue, microtubules in black, myelin in purple, axonal segment in yellow, and Tau protein as small red dots. Drawing prepared by Dr. Vieri Failli – Wings for Life Spinal Cord Injury Research Foundation. Tau is also present in the neurons. It is well known that in dementias, such as Alzheimer’s disease, neurons have hyperphosphorylated Tau protein, which makes it unable to bind to the microtubules. Hyperphosphorylated, non-microtubule-associated Tau is a common denominator of several dementias, which all tragically undermine the life of affected patients. A subset of dementias has hyperphosphorylated Tau in oligodendrocytes; these diseases, which have both myelin and gait anomalies, include primary progressive multiple sclerosis, corticobasal degeneration, frontotemporal dementia and progressive supranuclear palsy. These diseases can also occur together with other dementias, such as Alzheimer’s and Parkinson’s diseases, the latter widely known as a movement disorder. This study was undertaken to test the idea that, if Tau in oligodendrocytes is unable to bind to the microtubules, it will result in myelin and gait abnormalities. To achieve this goal, we developed a way to have oligodendrocytes, at our choice of time, start to express a truncated form of Tau that is not able to bind to the microtubules. In particular, the oligodendrocytes express a form of Tau that lacks the site required for it to bind to the microtubules. This truncated Tau was expressed in mice during the second postnatal week, when oligodendrocytes intensely extend processes. The study found that around the third postnatal week, the mice with truncated Tau had not only reduced myelin but also gait abnormalities. In particular, these mice had an unsteady walk with frequent falls. Thus, this in vivo model shows for the first time that when Tau in oligodendrocytes cannot bind to the microtubules, both the myelin and the gait are affected. Similar symptoms are seen in the most severe form of multiple sclerosis and in selective dementias characterized by hyperphosphorylated, non-microtubule-associated Tau in oligodendrocytes. Since a non-microtubule-associated Tau protein in oligodendrocytes can initiate devastating dementias, therapeutic intervention should enhance the binding of Tau to the microtubules. Such an approach will not only prevent but also treat both myelin and gait abnormalities, which could also halt the dementia that these diseases eventually manifest. Inducible Expression of a Truncated Form of Tau in Oligodendrocytes Elicits Gait Abnormalities and a Decrease in Myelin: Implications for Selective CNS Degenerative Diseases.